Rooly Eliezerov is the Co-Founder and President of Gigya. Regular listeners will already be familiar with Gigya, as we spoke with Jason Rose at last years Adobe Summit. 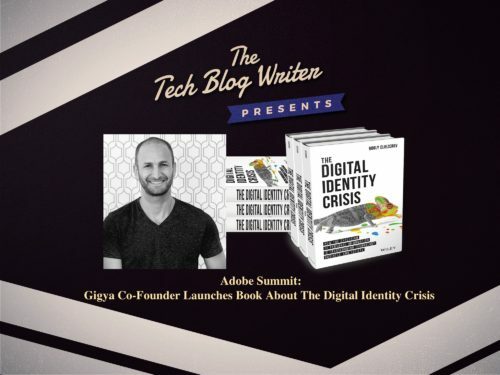 Since then, Gigya has been acquired by German software giant SAP, and Co-Founder Rooly has penned a book entitled, The Digital Identity Crisis, which is released today at the Adobe Summit. As president and co-founder, Rooly Eliezerov leads Gigya’s overall product strategy and development. Rooly began his career in architecture but felt limited by the constraints of physical buildings, which, once built, could be easily adapted to the needs of people. Rooly thus chose to focus on designing virtual environments in the digital world, moving into the Internet advertising and marketing industry, with a focus on product development. He, along with Eyal Magen and Eran Kutner, founded Gigya in 2006, guiding the company through multiple stages of funding and strategic pivots. Over the course of eleven years, Gigya grew into the acknowledged leader in the customer identity management space, before being acquired by SAP in September, 2017. The Digital Identity Crisis explores who we are when so much of our data is stored online, and so little of that data is actually owned and controlled by ourselves. While consumers continue to say they are concerned about the use of their data, they also increasingly share personal information with corporate entities, governments and a widening circle of friends and associates. The book explores the trends shaping identity, including business issues, policies on identity data privacy and ownership, and the future of decision-making informed by identity data. It also catalogs the evolving dimensions of individual identity which have emerged through the digital era and the challenges that businesses today are facing as a result, but how with those challenges also comes an unprecedented opportunity to forge truly personal, lasting relationships with customers which bridge both the digital and physical spheres. I invited Rooly to take a step away from the show floor and join us on today’s episode of the Tech Blog Writer Podcast. We discuss the key takeaways and themes coming out of his book, in the context of trends currently surfacing within the digital marketing landscape.